Our thought of customer support is much more than just the delivery. We offer a comprehensive service! The durability of our container is important to us, so we have an extensive range of original spare parts which we supply as quickly as possible according to your needs. Inform yourself about our spare parts list. 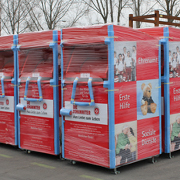 If there exists minor damage on your container or is a large-scale painting necessary, we`ll offer two options for repair. Spray: 400 ml in your RAL color. 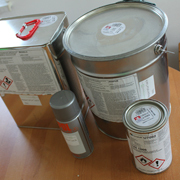 1-K-lacquer for mobile repairing of minor paintwork damages. Repairset: 10 kg 2-component paint in your RAL color. In separate containers hardener and thinner (necessary for mixing) are included. With a partner, we have developed a special detergent for removing graffiti. Because the containers are provided with a laminate layer, it is possible to remove almost all kinds of scribbling without attacking the surface. Our Collecting Box containers are available with different supplements. 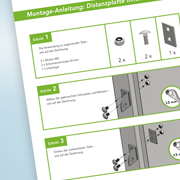 Connection set: If multiple containers are set up in series, the possibility of a fixed connection is given, without the need of holes. 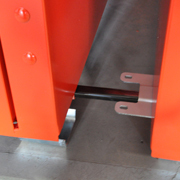 With simple steps, a U-shaped profile is introduced in both footrests. The container juxtaposed be screwed fourfold with two galvanized connecting plates. Safety valve: By double-sided facing of the flap a boarding the container is almost impossible. The left and right patched, triangular aperture hardly shrink the throw ability. The original goods may continue to fall easily into the interior of the container. 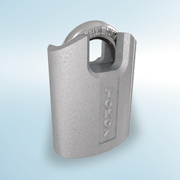 Locking system: The locks we offer are made exclusively for the container of collectingsystems. The lock consists of a cast iron body with ground closure. 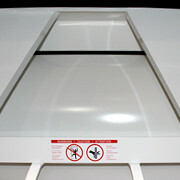 The closure strap is additionally protected with cast trims. 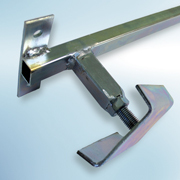 Each locking system is individually adjustable. The collectingsystems ensures that each customer receives its own locking system. If you need occupying documents to take place in tenders, like a declaration of conformity or DEKRA certificate, we´ll provide these at your disposal. Please contact us.